Enteric leakage represents one of the most serious complications of Roux-en-Y gastric bypass (RYGB), possibly leading to overwhelming sepsis and death if not diagnosed and treated promptly. The gastro-jejunal anastamosis accounts for the majority of such leaks, with the remainder being from the jejuno-jejunostomy and the excluded stomach. Leakage from the excluded stomach can be difficult to diagnose and presents a management conundrum for bariatric surgeons. In this study we report a novel approach of utilizing interventional radiology techniques to manage a leak from the excluded stomach. A 29 year old male, BMI 55, presented 1 week post RYGB with fever and non specific left upper quadrant abdominal pain. An upper gastrointestinal series demonstrated intact gastro-jejunal and jejuno-jejunal anastamoses. Computed tomography (CT) demonstrated a large fluid collection juxtaposed to the excluded stomach. A CT-guided percutaneous gastrostomy (7Fr) was introduced into the remnant stomach and dilute gastrograffin was utilized to identify the leak point at the excluded stomach. The gastrostomy tube was upsized (12Fr) and anchored into the remnant stomach and a secondary pig-tail catheter was placed in the residual fluid collection. The patient was discharged home on a bariatric fluid diet and a seven day course of oral antibiotics. The pig-tail catheter was removed 7 days post placement when output was scant (<20cc/24hr). A follow-up contrast study through the gastrostomy tube at 28 days demonstrated resolution of the leak, allowing the gastrostomy tube to be discontinued. The bypassed portion of the stomach is difficult to access and evaluate after RYGB. 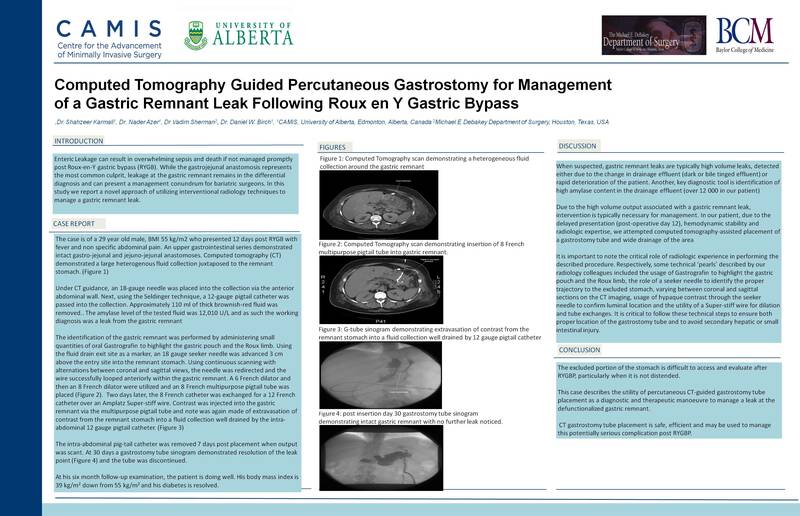 This case describes the utility of percutaneous CT-guided gastrostomy tube placement as a diagnostic and therapeutic maneuver to manage a leak at the excluded stomach. CT gastrostomy tube placement is safe, efficient and may be used to manage this potentially serious complication post RYGB.